The SL-86-911 offers a rugged keyboard and a rugged computer pointing device in one compact package. Ideal for public safety applications, it features a specially designed emergency key and red LED backlit keys. The SL-86-911 integrates the HulaPoint II™, an upgraded pointing device that offers improved sensitivity and increased durability. Featuring a compact design with mounting holes, the SL-86-911 fits securely in a vehicle’s console to serve effectively as a mobile application. 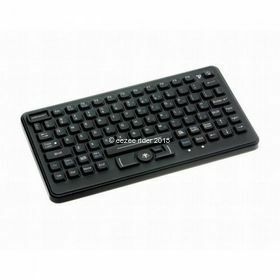 It boasts a completely sealed and ruggedized construction that allows it to meet NEMA 4X specifications, ensuring that this keyboard is sealed against the elements or unwanted spills.